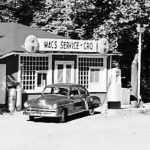 By Hollis M. Owens, Sr.
Officers elected were R. R. Haynes, President; Chas, H. Haynes, Vice President; Z. O. Jenkins, Secretary and Treasurer; and J. B. Watkins, General Manager. One of the items of business transacted at the meeting was the adoption of a resolution by the Board of Directors looking to the purchase of a tract of land from R. R. Haynes of 140 acres and on which was already situated some 13 dwellings and various other improvements. Plans for a 20,000 spindle spinning and weave mill was also presented at the meeting. 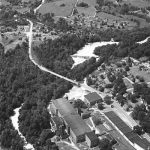 The purchase and transfer of the 140 acre tract of land referred to was completed September 25, 1916, and marks the beginning of The Haynes Mill and on which most of the town of Avondale is located. 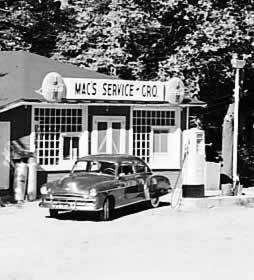 A General Merchandise Store was opened up and operated in connection with the main Company Store at Cliffside, N. C., under the supervision of Mr. John G. Roach, Manager. The U. S. Post Office was located in this store building and Mr. John G. Roach was the first Postmaster. Sometime prior or possibly along with the beginning of the work on the mill the Cliffside Railroad was extended from Cliffside Junction to the site and to serve the new plant. Arrangements were made and work begun to carry to completion the building of the new mill and the village. The name of the town, Avondale, was given, this being the name of the winter home of Mr. R. R. Haynes in St. Petersburg, Florida. Mr. J. B. Watkins, who was also cashier of The Haynes Bank (then in Avondale), was in charge of construction work and Mr. T. A. Biggerstaff performed valuable service in carrying on the building program. 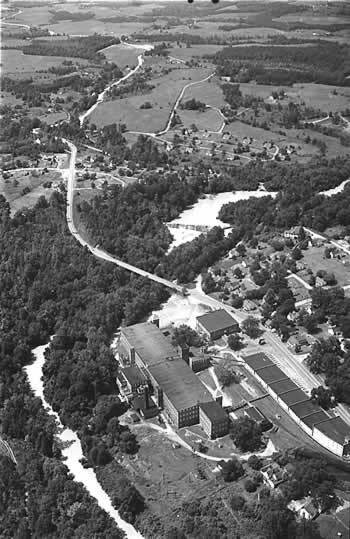 To begin with, it was the plan that Mr. R. R. Haynes and his family would build the mill and the village of Avondale. Previously in 1897, he had built the Florence Mills at Forest City and just after the turn of the century around 1901 he had built Cliffside Mills and the town of Cliffside, North Carolina. In January 1917, Mr. R. R. Haynes was spending a few weeks for vacation and rest at his winter residence in St. Petersburg, Florida. While there and during the course of a conversation with friends in the front yard of his home he suffered a stroke of apoplexy and died suddenly February 6, 1917. At this meeting it was decided to sell the property to Cliffside Mills and dissolve the corporation of Haynes Mills Inc. Mr. Chas. H. Haynes succeeded his father as President and it was under his management that the property of Haynes Mill was transferred to Cliffside Mills and the building of the new mill was completed. The war going on, not much was done until late 1918, and in 1919 machinery was installed and the operation of a hosiery mill manufacturing men’s socks was started. This was discontinued in 1920 and the manufacturing of chambray was begun and the mill continued to make this product until the late 1930’s when cotton and rayon specialties were also manufactured. During World War II, the mill produced approximately 100% Osnaburg. After the close of World War II, the manufacture of Greige Goods was begun and the mill has since continued on this product. Mr. Maurice Hendrick was the first superintendent, which position he held until about 1921 when he became Superintendent of Cliffside Mills. In the building of the mill and the village, it is interesting to note the source of the timber and lumber used in part of the mill and most of the village of approximately 178 houses. During the period 1917-1920, the company operated a fertilizer plant at Avondale, manufacturing fertilizer which was sold direct to farmers in the immediate territory. Mr. J. B. Watkins, Manager, was returning from a trip to Charleston, South Carolina to purchase fertilizer material for the plant, and while passing through Wadesboro, North Carolina, he chanced to see a notice of sale of some 7OO acres of timberland known as the Ratliff Estate near Lilesville, North Carolina. He got off the train, stayed over and went to see the timber and found it to be very good, and put in a bid. After several weeks he succeeded in purchasing the tract which proved to be very valuable. 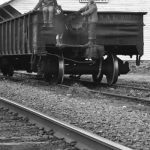 Mr. Watkins moved in several saw mills and cut 2 1/2 to 3 million feet of lumber which was shipped on railroad flat cars to Avondale and went into the building of Haynes Mill and the town. In about 1923, great deposits of gravel was disclosed on the land and millions of tons of gravel have since been mined and shipped to all parts of the country by B. V. Heddrick and Company, who first leased the property and to whom it was sold outright in the early 1930’s. In the years around 1923 cotton was still king in Rutherford county and to serve the farmers in the surrounding territory a large cotton gin was built and operations begun during that year. Mr. T. J. Wilkins, who for years had been engaged in ginning and buying cotton locally from the farmers, was brought from retirement and helped for about two seasons to get this phase of operations under way. Mr. R. E. Jenkins, Outside Overseer for years and who operated the gin, relates that as many as 3600 bales of cotton was ginned in one season and that 102 bales was the largest amount of bales ginned in one day. This cotton was ginned and bought by the company, on the ground. The cotton gin building which still stands brings to mind the day when from early morning until late at night wagons and trucks were on the grounds loaded with cotton to be ginned daily during the fall season of the year. To break the monotony of the continuous whirr of the ginnery the occasional braying of a mule who had helped produce some of the cotton on the grounds could be heard for some distance around. During the early 1940’s, cotton gin operations were discontinued and the machinery sold. In the late 20’s or early 30’s, Mr. H. G. Rollins, Overseer of Spinning of Cliffside Mills, was made Superintendent of the Haynes Plant where he remained until 1942, when he accepted a position with J. P. Stevens and Company. He was succeeded by Mr. J. L. Beard who, on his retirement, was succeeded as superintendent by Mr. Ray Stallings. The plant was designated as Cliffside Mills, Haynes Plant, until 1952. Mr. Chas. H. Haynes served as President until 1945 when he retired. Mr. Maurice Hendrick succeeded him and served until 1951, retiring during the year. Mr. Earle R. Stall, Sr. was elected President of Cliffside Mills in 1951 and in 1952 Cliffside Mills merged with and became a part of Cone Mills Corporation, of which Mr. Stall was Vice President. The mill was under his management until 1960 when, having served beyond his regular retirement date, Mr. Stall retired. He was succeeded by Mr. Earl R. Stall, Jr., Assistant Vice President of Cone Mills Corporation, who was in charge of the Florence Division, consisting of the Florence Plant, Forest City, North Carolina; American Spinning, Greenville, South Carolina; and in 1960 the Haynes Plant, Avondale, North Carolina, became part of the Florence Division of Cone Mills Corporation, Greensboro, North Carolina. Thus the essential story of the building of the Haynes Mill and town of Avondale is given. The building of the mill and town required much more labor and hard work than if it were done today. In those days men still walked a mile or two and probably forded a swollen stream in order to begin the day early enough to do a good day’s work by sundown. Their efforts accomplished much and founded a textile plant and community that today the state of North Carolina is proud to call part of the very fine industrial section of lower Rutherford County. Hollis M. Owens, Sr. 1896-1980, a veteran of World War II, served for a time as president of Cliffside Railroad. He is buried in Cliffside Cemetery. Our thanks to Mack Hendrick for providing this copy of Mr. Owens’ history.